The Chrysler Town & Country is related to the Dodge Grand Caravan, but it's the more luxury-oriented of the two minivans. The Town & Country was significantly revised for 2011 with new exterior styling, a substantially revised interior and a new V-6 engine. The seven-seat minivan competes with the Toyota Sienna and Honda Odyssey. Town & Country includes 283-horsepower, 3.6-liter V-6 with 260 pounds-feet of torque, Six-speed automatic transmission, Econ mode improves gas mileage by altering shift points and maintaining torque-converter lockup longer, and Available load-leveling suspension. Six-speed automatic transmission, and Econ mode which improves gas mileage by altering shift points and maintaining torque-converter lockup longer. Load-leveling suspension is also available and Regular gas is acceptable. Chrysler introduces two new models for the Town & Country for 2015: the LX and Limited Platinum. The LX has leather seats, a backup camera and other special safety features. The Limited Platinum has a sunroof, dual-screen Blu-ray system and other features. A Blu-ray player with HDMI connection is available for all models. Chrysler Town & Country's exterior also features integrated side-door tracks, 17-inch aluminum wheels, chrome grille, power-sliding side doors, power liftgate, and roof rack crossbars can be stored inline with rails. Interior includes leather upholstery, automatic air conditioning with rear controls, second-row seats fold into bins in the floor, sliding center console with power outlet, rear-seat DVD entertainment system with a 9-inch overhead screen, available navigation system, second- and third-row retractable window shades, front- and second-row heated seats and heated steering wheel, power-folding third row, and wireless internet hot spot. Required in every Town & Country are front airbags, antilock brakes, and an electronic stability system. Also included are Side-impact airbags for the front seats, Side curtain airbags for all three rows of seats, Traction control, Active front head restraints, Backup camera, Power-adjustable pedals, Available rear parking sensors, and blind spot warning system with rear cross-path detection. For more information on this vehicle, feel free to give us a call today! 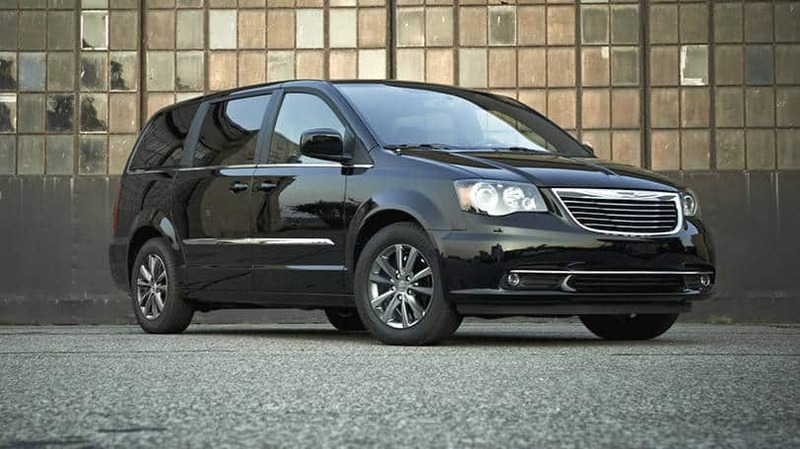 Learn more about this model on the Official Chrysler Town & Country Website.